I’m going to start in reverse because I am (despite the stupor-inducing heat and humidity) jumping up and down – in my head – about my day today. Borne out of the desperation induced by a failed copy center and lack of toner, negating all of my well-wrought discovery/Mathalicious plans for today at least, I executed my first 3 ACT TASK! There was a part of me that never believed I would get to this, that it would remain something that I-would-do-if-only-there-was-room-in-the-curriculum, that I just couldn’t execute the questioning well enough to make it work. But arriving at school this morning to find myself without resources, I decided that IT WAS TIME. So after I panicked and growled at the first 5 people unlucky enough to encounter me with a crisis at 7 a.m., I took the plunge. I love the Pyramid of Pennies. I love the video of Dan Meyer working the NRICH crowd with that task, and Fawn Nguyen’s exhortation to change things up in your classroom with a culture of problem-solving totally informed my approach to planning this year. 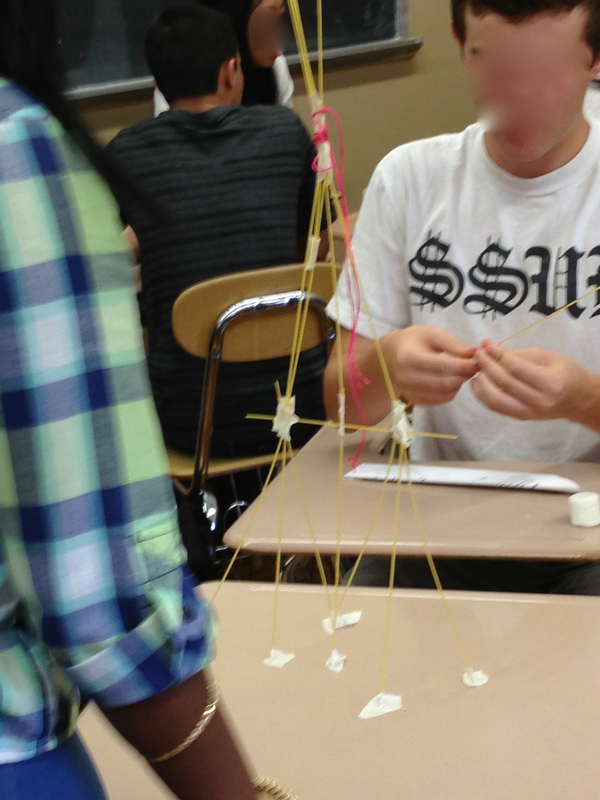 So in my Discrete Math and Algebra 2 classes today, we examined the Pyramid of Pennies. And it was great. In 90 degree heat, students were guessing, estimating, asking questions – there were many, many hands raised, and lots of math chat. 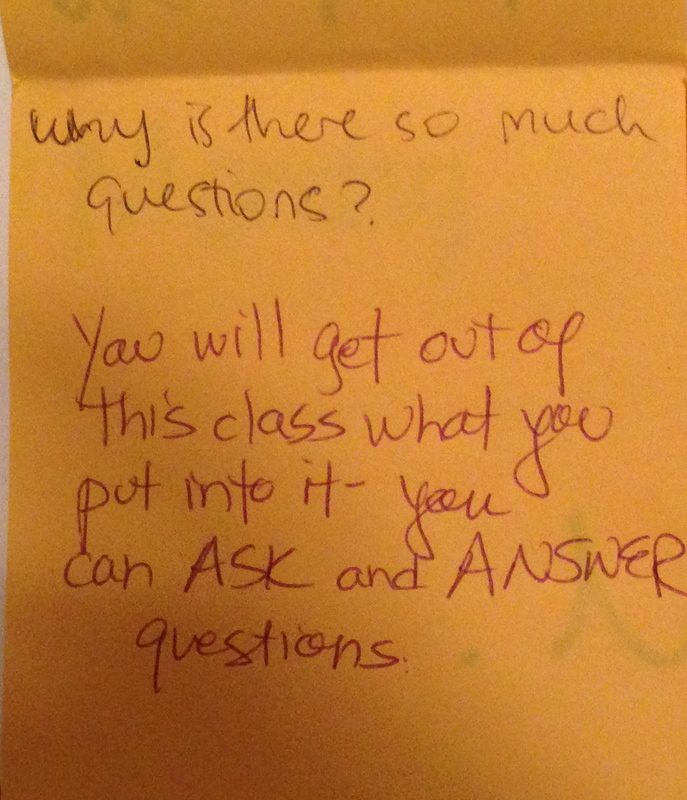 My afternoon classes in particular were impressive – the temperature was peaking, the room was packed (36 kids – we needed to to borrow desks from another room), but I had too many volunteers with questions and ideas to be answered in our 44 minute session. 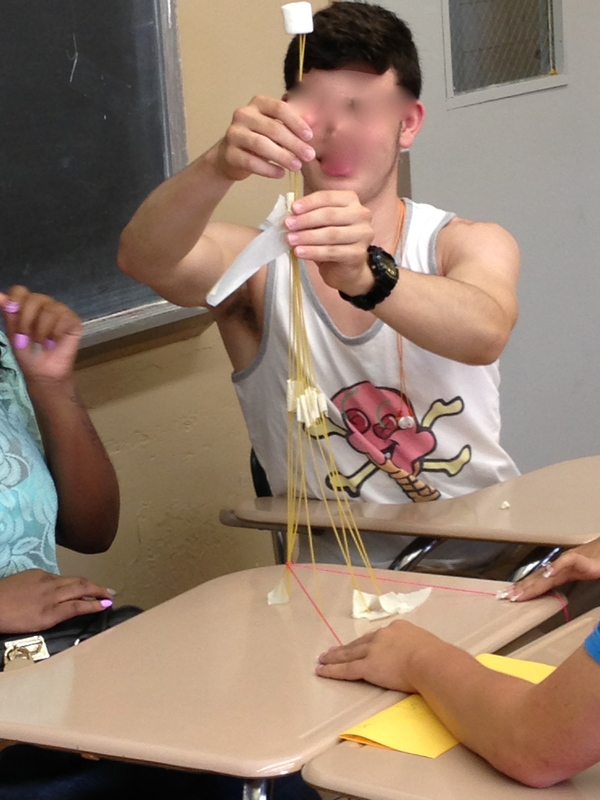 Yesterday, Ms. Menard’s classes competed against one another in the great Marshmallow Challenge. 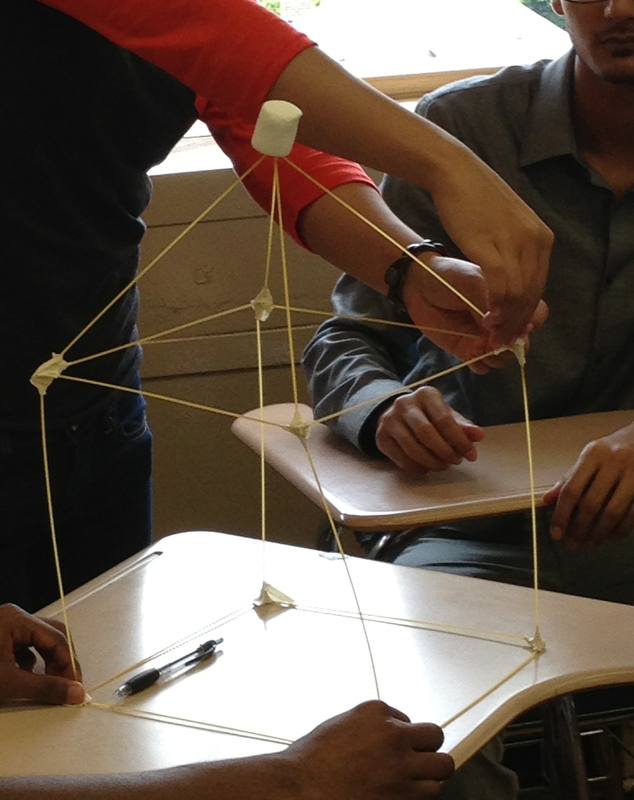 Again, great fun, interesting ideas, even if approximately 70% of the structures could not be measured due to their inability to remain standing long enough. Still, the conversations were good, and the cooperation of students randomly grouped on the second day of school was impressive. Some of the students want to know when we are going to do “real math” and why we are working on our estimation skills. (They’ll find out.) 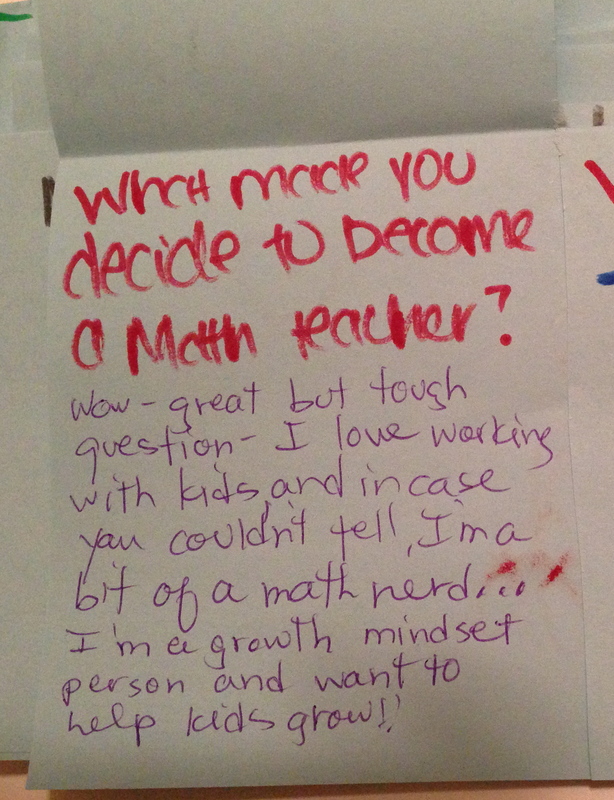 The comments I find most touching, and heartening, are those which evidence that some students already perceive that my classroom is a ‘safe’ place, and that my growth mindset means that I believe they can and will learn math. Three out of my five classes are with off-track students – juniors and seniors (more than a few of whom I have previously had in class) – motivating these kids to once more attempt something they have already failed at multiple times is MY challenge. But I see that I am on the right track, and earning their trust – a very good first step. A final positive note – I don’t have my own classroom (school is way overcrowded) but I share an ‘office’ with three other like-minded math teachers in an out-of-the-way corner of the school, surrounded by the Foreign Language department (kind of poetic, don’t you think? I like the interdisciplinary opportunities this affords; we spend a lot of time engaged in mutual student support with the ESL teachers). 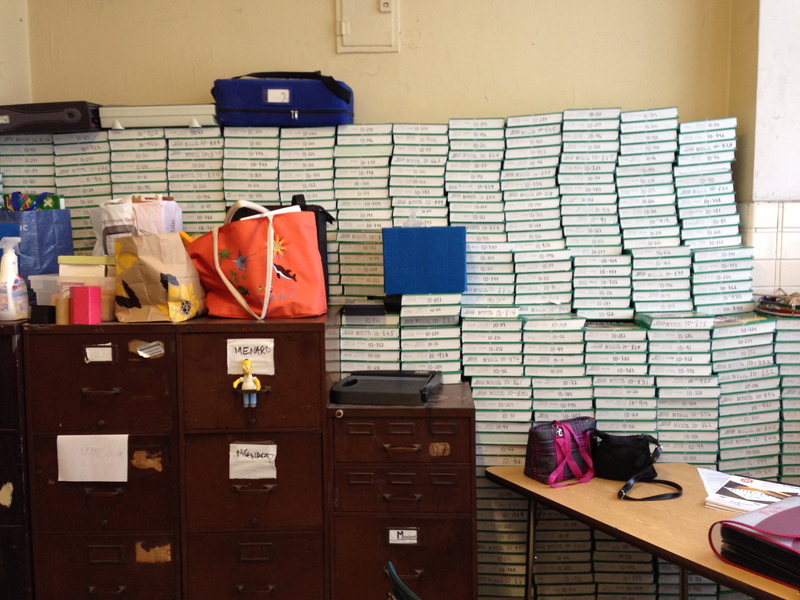 Our office is known as the Bat Cave, and we’ve cleaned it up quite a bit, including organizing the out-of-use monster Algebra 2 textbooks (aka Glencoe’s 2008 3rd quarter profit) which are stored there for lack of other space. It may not look like much, but in a 75 year old NYC public school with no room to spare, it’s a cozy spot in which to continue this banner school year. 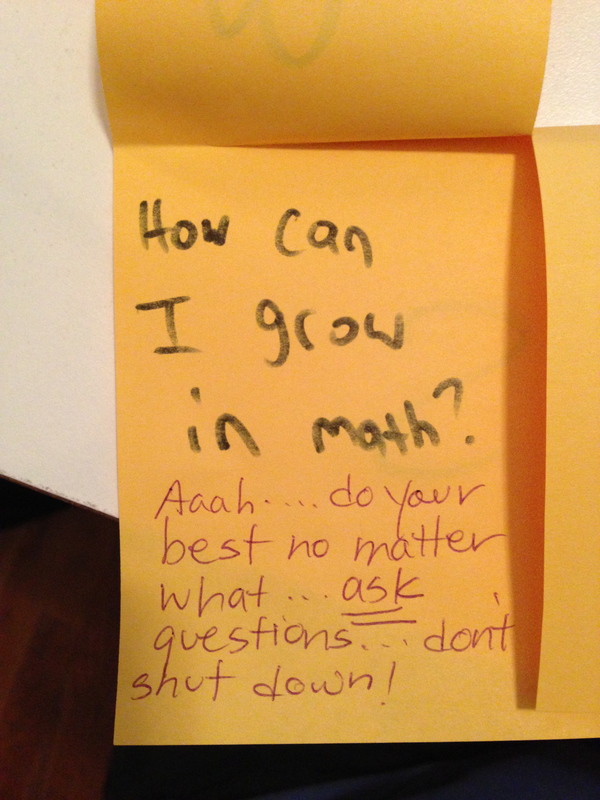 All it needs is our soon-to-be-delivered MathMunch poster, which will be featured prominently on our door. On this night of remembrance, I’m grateful for these great first days. Awesome! Congrats in jumping in with both feet and trying the three act! Sounds like an exciting couple of days, in spite of the heat. 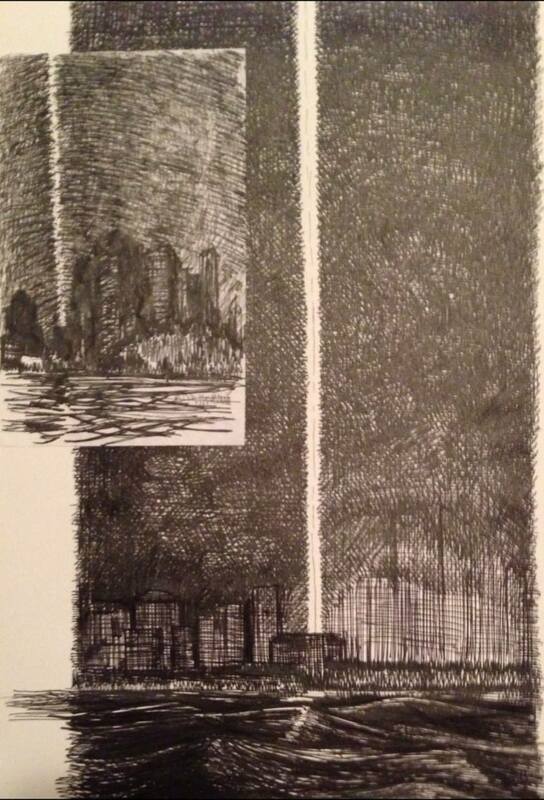 I started with math that didn’t seem like “real” math and I am thinking its paying off now. The students are working well together and have caught onto the fact that we work hard in class. Thanks, Stephanie. 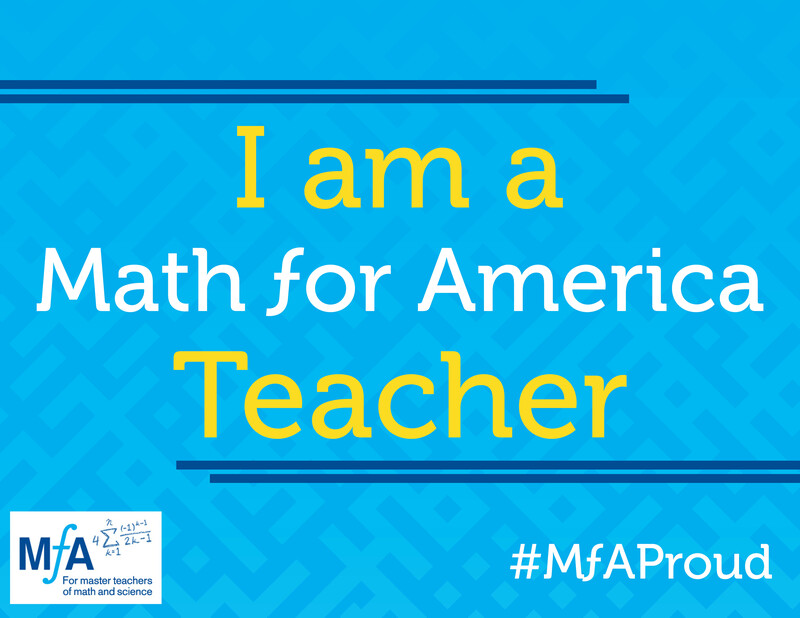 It’s really everyone’s support, enthusiasm and generosity that got me going – I feel buoyed up by the #MTBoS! You’ve been so helpful, and I appreciate it so. Thanks for stoping by, Amy, and for the words of support. As I am riding on the bus today, I am wondering whether I will have Internet in my classroom, or whether I will have to improvise…again. Wendy for president!!!! (Not that you’d want the job.) Really heart-warming, Wendy, to read about your kids’ enthusiasm (and sense of safety) as they DO mathematics. It’s all about a great start. Can only get even better from here. Thank you for sharing! Thanks, Fawn – definitely would NOT want to EVER do ANYTHING in politics; I’d much rather be in a field where I can actually make a difference in someone’s life! Today in Algebra 2 we did Five Easy Pieces from Exeter Math; who knew the sight of 36 teenagers cutting up pieces of paper silently in groups could make me deliriously happy?